Discovered in 1789 by British astronomer William Herschel, Mimas is both the smallest and closest of Saturn’s moons. 400 km in diameter, the surface of the satellite is pocked with craters, but it’s the biggest one that really makes this look like the Death Star. Its name is Herschel, which, as you probably guessed, got its name from the man who discovered the orb in the first place. Herschel is 130 km across, with walls approximately 5 km tall, and a with a 6 km peak in the middle. 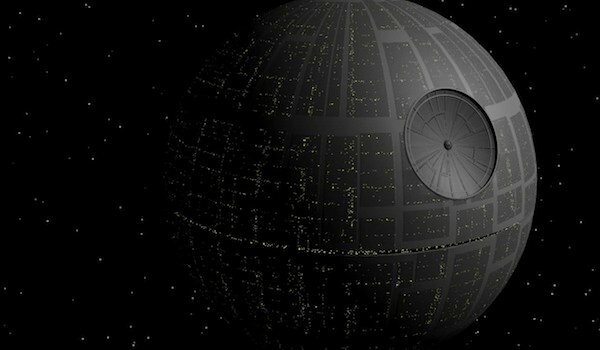 The Death Star, as you well know, is the Imperial battle station that is most notorious for being able to blast an entire planet out of sky (it’s also known for the fact that they should have been more careful about covering exposed exhaust ports). We watched it rain down thunder on Alderaan and reduce that once vibrant world to so much space rubble. Mimas, on the other hand, may actually have come pretty damn close to becoming space rubble itself at some point in its history. 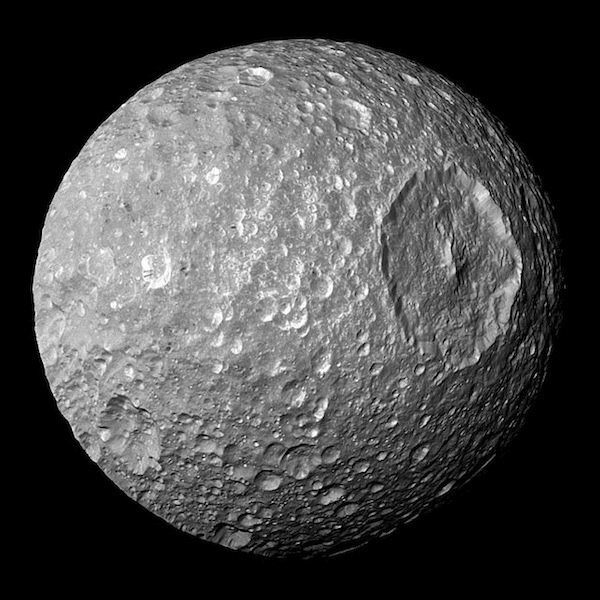 Leaving a 130 km dent in a celestial body obviously takes a pretty good-sized object, and scientists speculate that whatever crashed into Mimas and left Hershel as a scar, likely came very close to cracking the moon apart. Good thing it wasn’t a fledgling Jedi piloting his X-Wing Fighter and using the Force for targeting assistance, or else Mimas might not be there today. Mimas orbits Saturn at a distance of 200,000 km and takes roughly 23 hours to make a complete circuit. Much like our moon, the same side of Mimas always faces the surface of the planet it revolves around This is because it takes just as long to rotate on its own axis as it does to circle around its partner. It is also theorized that the moon is made up almost entirely of ice, which, at the current time, is the only substance that has ever been found there. Basically, while it resembles the Death Star in appearance, the Imperial battle station seems like it would be a way better place to live than Mimas. Sure, that probably means you’re an Imperial stooge, and you’re way more likely to bet blown out of the sky by a bunch of Rebel scum, but, you know, plumbing and breathable air are nice bonuses.